There is a great relation between art and culture. Culture influences art and allows it to evolve into something unique whereas art also promotes culture as it spreads and showcases the value and belief of its culture. Wayang means shadow in Indonesian and it is one of the best-developed story telling methods in Indonesia. Beautiful and exquisite Wayang Kulits (leather shadow puppets) are created and used behind a large screen. Light will be lit from behind to cast shadows on the screen and the performers, called Dalang will control and voice for the Wayang Kulits to tell stories to the audiences. Wayang is not just considered as a show but ‘represents an abstract world in which ideas take human shape and imagination becomes reality…something that can not be adequately expressed in words becomes comprehensible. (Wagner, 1959)’. The mix of religious and culture heritages in Indonesia shaped a society with traditions that can be seen as a fusion of foreign and indigenous. Wayang is believed to be imported from either India or China. The most told stories in a Wayang performance are Ramayana and Mahabarata, two of the epic noble tales in Hinduism. The art form developed into its own unique system influenced by the religious, political and cultural phenomenon. 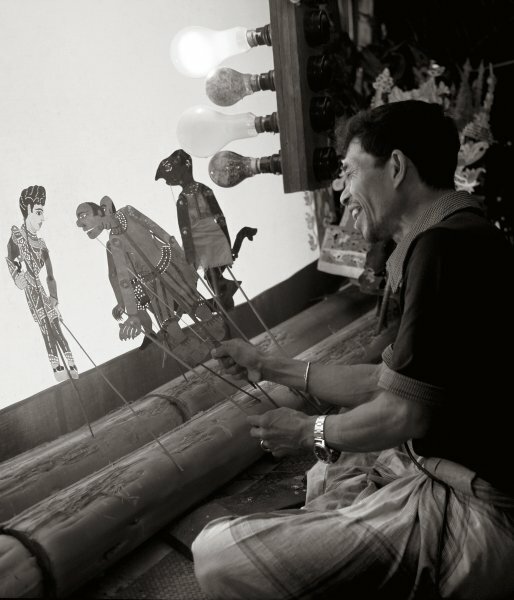 The beautifully carved and made puppets can be seen as arts but the entire performance is what makes Wayang influential and educating. The stories of Wayang contain a profound philosophy applicable to contemporary life (Suswantoro, 2014). Wayang in deeper understanding also represents primarily about the conflicting good and the evil characters inside humans (M, Hum, 2013). The story telling and performances are merely for entertainment but also holds spiritual connections as it conveys and spreads values and religious beliefs. Criticisms of contemporary social and political events are commonly being added into Wayang performances nowadays by the Dalang as they narrate for the puppets. The adaption of Wayang for educating people has rendered traditional values and concepts in a new form (Poshyananda, 2011). For thousands of years, Indonesians developed complex agricultural societies and cultural traditions. Wayang is maybe the most interesting art form and watching the performances is a great way to learn about Indonesian culture. Its unique way of storytelling breaks down the boundary of language difference. The craftsmanship of Wayang Kulit and the act itself are important cultural heritage that should be valued and indoctrinated by more people. It was really interesting to read about how this traditional practice has been shaped by Indonesian cultural and religious contexts, as well as other cultures like Chinese and Indian. The aesthetics are beautiful and show a great deal of detail and effort put into the puppets.